NBC dealt the opposition a pair of crushing blows Monday night with the 12th edition launch of The Voice and the premiere of Taken. Airing from 7 to 9 p.m., The Voice easily topped all prime-time programming with 407,182 D-FW viewers and 166,769 in the advertiser-coveted 18-to-49 age range. Taken dropped off considerably but still cruised in the 9 p.m. hour with 232,675 total viewers and 83,385 within the 18-to-49 realm. ABC had mixed returns with the first two hours of When We Rise, a four-part dramatization of the LGBT movement that will continue on Wednesday through Friday nights. Rise performed dismally in total viewers, drawing just 72,711 to finish last from 8 to 10 p.m. in the Big Four broadcast network universe. But well more than half of its audience -- 44,899 viewers -- was in the 18-to-49 motherlode. That was good enough to finish second from 8 to 10 p.m. in competition with CBS’ Superior Donuts, 2 Broke Girls and Scorpion, Fox’s APB and Fox4’s local newscast. Like all networks, ABC would much rather be strong demographically. So Rise’s performance among 18-to-49-year-olds is a fairly big plus in that context. NBC5 and TEGNA8 tied for first place in total viewers at 10 p.m. while the Peacock was alone on top with 25-to-54-year-olds (main advertiser target audience for news programming). Fox4 and NBC5 shared the 6 a.m. lead in total viewers, with Fox4 keeping the 25-to-54 gold to itself. Fox4 swept the 5 p.m. competitions and also won at 6 p.m. with 25-to-54-year-olds. TEGNA8 ranked first at 6 p.m. in total viewers. And the winner is . . . well, it wasn’t Bonnie and Clyde. Nor was it the Oscar-cast as a whole, at least in the D-FW ratings. 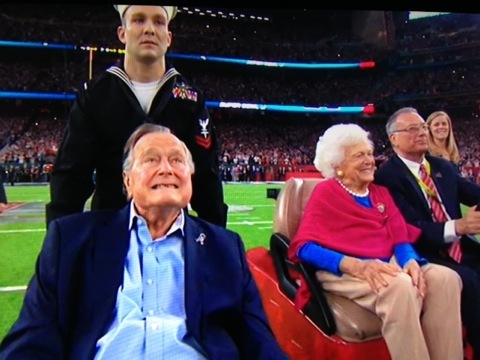 Sunday night’s 3 hour, 45 minute ceremony, hosted by Jimmy Kimmel and ending in embarrassment, averaged 763,466 total viewers and 339,953 in the advertiser-prized 18-to-49-year-old demographic. That’s a significant drop-off in total viewers from the 2016 ceremony hosted by Chris Rock. It drew 878,218 viewers, which was down pretty sharply from the 1,004,256 for the 2015 Oscars hosted by Neil Patrick Harris. The fall-off wasn’t as steep among 18-to-49-year-olds. The Rock-hosted Oscars had 346,151 viewers in this key demographic while Harris and the 2015 show drew 428,197 viewers in the 18-to-49 realm. The screwup came with many potential D-FW viewers either in bed, asleep or tired of the whole thing. Oscar’s closing 15-minute segment was the least-watched of the night, with 625,315 total viewers and 282,225 in the 18-to-49 age range. 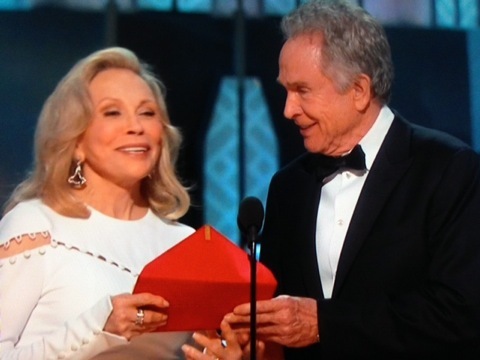 The Oscars still smashed all competing programming. Fox4’s 9 p.m. local newscast fared the best in direct competition, drawing 130,880 total viewers. In Friday’s prime-time Nielsens, CBS’ 8 p.m. episode of Hawaii Five-0 topped all programming in total viewers with 254,489 while ABC’s competing hour of Shark Tank was tops with 18-to-40-year-olds (38,485). On Thursday, CBS’ The Big Bang Theory as usual led all prime-time attractions in both ratings ratings measurements with respective totals of 349,013 and 131,491 viewers. Wednesday night’s top performers were Fox’s Lethal Weapon in total viewers (254,489) and ABC’s Modern Family with 18-to-49-year-olds (99,420). CBS has pulled Doubt from its Wednesday night lineup after airing just two episodes in the 9 p.m. hour. And on Thursday, the death of Bill Paxton apparently will mean the end of Training Day, in which he co-starred. The series had been performing poorly ratings-wise at 9 p.m. Here are the Wednesday-Friday local news derby results, with just three weekdays now remaining in the February “sweeps” ratings period. Thursday -- TEGNA8 again drew the most total viewers at 10 p.m., but NBC5 ran first with 25-to-54-year-olds. Fox4 had twin wins at 6 a.m. and NBC5 won at 5 and 6 p.m. in the 25-to-54 measurement. Fox4 and TEGNA8 tied for the most total viewers at 5 p.m., and TEGNA8 had first place to itself at 6 p.m.
Friday -- CBS11 broke through with a 10 p.m. win in total viewers, but NBC5 was tops with 25-to-54-year-olds. Fox4 stayed strong at 6 a.m. with another sweep and also ran the table at 5 p.m. NBC5 and TEGNA8 shared the total viewer spoils at 6 p.m. while the Peacock took the sole gold among 25-to-54-year-olds. Tuesday’s two thoroughbreds, NCIS and This Is Us, again punched winning tickets in the prime-time Nielsens. The CBS evergreen topped all D-FW attractions in total viewers with 407,182. And NBC’s first-year smash easily drew the most advertiser-prized 18-to-49-year-olds (147,527). This Is Us also won its 8 p.m. hour in total viewers with 319,928. And NCIS took its 7 p.m. slot in the 18-to-49-year-old demographic (70,556). In a split decision at 9 p.m., CBS’ NCIS: New Orleans had the most total viewers (254,489) while NBC’s Chicago Fire led among 18-to-49ers with 44,899. ABC again had the most have-nots throughout the night, although Fox’s 7 p.m. episode of New Girl drew the fewest total viewers (a sub-paltry 36,356). ABC’s 8:30 p.m. episode of The Real O’Neals set the prime-time low bar in the 18-to-49 realm with 12,828. Both comedies are looking like virtually certain cancellations after playing out their strings. CBS11 ranked first in total viewers at 10 p.m., while NBC5 edged Fox4 and TEGNA8 for the top spot with 25-to-54-year-olds (main advertiser target audience for news programming). Fox4 had twin wins at 6 a.m. and NBC5 swept the 5 and 6 p.m. competitions in both ratings measurements. The sweeps end next Wednesday, March 1st. February’s unseasonable warmth, with more of the same coming, is not lighting a fire under D-FW’s prime-time ratings. Absent any “arctic blasts,” many potential viewers apparently are getting out and about rather than hunkering down. Delayed viewing will perk up most of these numbers over the next few days. Still, the same-night Nielsen ratings continue to be notably low during a “sweeps” month in which the Big Four broadcast networks are offering new series episodes night after night. CBS’ Thursday night leadoff hitter, The Big Bang Theory, as usual led all programming with 356,284 viewers. It also drew the most advertiser-prized 18-to-49-year-olds 112,249). Last year’s mid-February episode of Big Bang had 410,779 total viewers -- and that was against the opening half-hour of Fox’s American Idol. ABC’s resident evergreen, Grey’s Anatomy, won from 7:30 to 8 p.m. in both ratings measurements. But its full-hour hauls were just 167,235 total viewers and 64,142 in the 18-to-49 realm. CBS’ 8 p.m. episode of Mom won its half-hour in total viewers before the second half-hour of ABC’s Scandal tied CBS’ Life In Pieces from 8:30 to 9 p.m. Scandal ran first throughout the hour among 18-to-49-year-olds. NBC’s Blacklist closed out prime-time with 9 p.m. wins in both ratings measurements. Again the numbers were hardly imposing -- 138,151 total viewers and 51,314 in the 18-to-49 age range. NBC’s superhero sitcom, Powerless, was the least-watched prime-time attraction across the board. So Powerless is a fitting title. Here are Thursday’s local news derby results for the 11th weekday of the February sweeps. TEGNA8 stayed solid at 10 p.m. with a win in total viewers while NBC5 again was No. 1 with 25-to-54-year-olds (main advertiser target audience for news programming). Fox4 swept the 6 a.m. competitions and also ran first with 25-to-54-year-olds at both 5 and 6 p.m. NBC5 and TEGNA8 tied for the most total viewers at 6 p.m. and the Peacock won outright in that measurement at 5 p.m. The new CBS legal drama Doubt at best left a hung jury in Wednesday’s D-FW Nielsens. Starring Katherine Heigl as a defense attorney whose showcase client is also her lover, Doubt opened at 9 p.m. with 123,609 viewers and 25,657 in the advertiser-craved 18-to-49-year-old demographic. That was good enough to outdraw ABC’s competing Match Game (just about anything is), but otherwise bad enough for third place at 9 p.m. among the Big Four broadcast networks. NBC’s Chicago Fire led at that hour in total viewers with a hardly imposing 159,964 while Fox4’s local newscast was more comfortably on top with 18-to-49-year-olds (51,314). The Fox network’s Lethal Weapon ranked as the top overall prime-time attraction in both total viewers (269,031) and 18-to-49-year-olds (83,385). TEGNA8’s 10 p.m. newscast continued to impressively rebound from skimpy ABC lead-ins, at least in total viewers. It won in that measurement but slipped to a fairly distant third behind frontrunner NBC5 and runner-up Fox4 among 25-to-54-year-olds (main advertiser target audience for news programming). Fox4 ran the table at 6 a.m. and TEGNA8 placed first in total viewers at 5 and 6 p.m. The 25-to-54 wins went to NBC5 at 5 p.m. and Fox4 at 6 p.m.
Fort Worth-based NBC5 is replenishing its weather team with Keisha Burns, who is scheduled to start at the station on Feb. 27th. 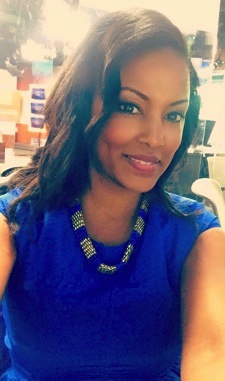 She replaces Remeisha Shade, who left NBC5 in late November after a six-year stay. Neither party has been willing to comment any further on the reasons for her departure. Burns is joining NBC5 from Seattle’s NBC affiliate, KING-TV, and NWCN (Northwest Cable News), which recently went off the air. She spent the last seven years in Seattle. Burns also has worked at Bend, Oregon’s KTVZ-TV. In making the announcement late Monday afternoon, NBC5 vice president of news Mark Ginther said that Burns “primarily will work mornings,” with a regular assignment on the weekend A.M. newscasts. She’ll also “assist” on some weekday morning editions. Incumbent meteorologist Brian James will move from weekend mornings to evenings. Burns grew up in Southern California, but also has family in North Texas, Ginther said. CBS got a big tune-in for the Grammys Sunday night, with Adele dominating both the major awards and the performance stage. Her mid-song request for a do-over on a George Michael tribute song helped the show to run 11 minutes past its scheduled 10:30 p.m. finish. But the second time around was much better while her mid-course correction will live on in Grammy lore as a bonafide, heartfelt moment, complete with f-bomb (for which she profusely apologized). 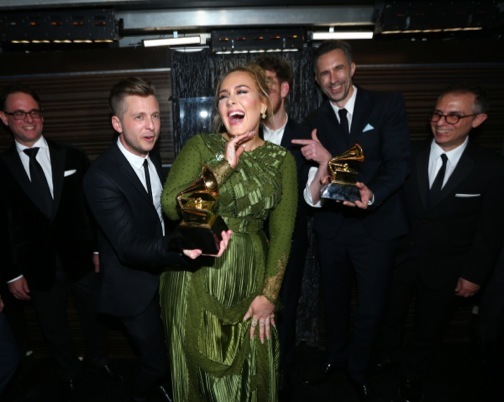 Hosted by first-timer James Corden, the 59th annual Grammys averaged 661,670 D-FW viewers and 288,639 in the advertiser-coveted 18-to-49-year-old demographic. Nothing else came even remotely close. And the numbers were slightly up from last year’s awards, which drew 658,663 total viewers and 285,813 in the 18-to-49 age range. On Saturday, NBC’s Saturday Night Live, with Alec Baldwin hosting for a record 17th time, led all programming in the day or night with 196,320 total viewers and 96,213 in the 18-to-49 realm. That swamped ABC’s marquee prime-time NBA game in which Kevin Durant returned to Oklahoma City for the first time since jumping to the Golden State Warriors. Golden State’s rout of the Thunder averaged 109,067 total viewers and 44,899 in the 18-to-49 motherlode. Friday night’s top scorers were CBS’ Blue Bloods in total viewers (247,217) and CBS’ Hawaii Five-0 among 18-to-49-year-olds (44,899). Fox4 and NBC5 tied for the most total viewers at 6 a.m. while the Peacock won outright with 25-to-54-year-olds. TEGNA8 swept the 6 p.m. competitions. The 5 p.m. golds went to NBC5 in total viewers and CBS11 in the 25-to-54 age range. NBC and CBS may soon have to send in replacements for their Thursday night newcomers. Both the Peacock’s Powerless and CBS’ Training Day played dead with their second episodes. At 7:30 p.m., Powerless hit Thursday’s prime-time low in total viewers with just 65,440 in the Big Four broadcast network universe. The superhero sitcom also placed last at 7:30 p.m. among advertiser-prized 18-to-49-year-olds with just 32,071. Training Day ran fourth in total viewers at 9 p.m. with 72,711. Even worse for CBS, its latest crime hour hit Thursday night’s low in the 18-to-49 demographic (a paltry 19,243 viewers). CBS as always fared much better with The Big Bang Theory, which led off the night with 356,284 total viewers and 188,663 in the 18-to-49 age range. ABC then flexed a little, winning in both total viewers and 18-to-49-year-olds from 7:30 to 9 p.m. with the second half of Grey’s Anatomy and Scandal. The 9 p.m. golds went to NBC’s The Blacklist in total viewers and ABC’s How to Get Away with Murder among 18-to-49-year-olds. Here are Thursday’s local news derby results for the sixth weeknight of the February “sweeps” ratings period. 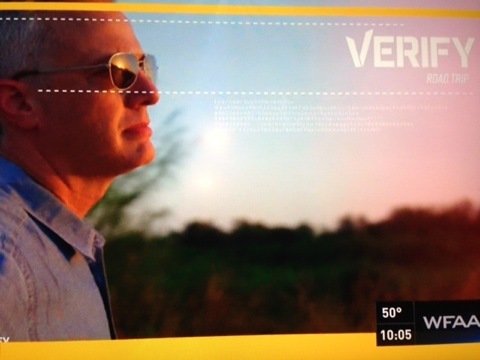 NBC5 swept the 10 p.m. competitions in total viewers and 25-to-54-year-olds (main advertiser target audience for news programming), with TEGNA8 notching a pair of close seconds. The Peacock and Fox4 tied for the top spot in total viewers at 6 a.m., but NBC5 had first place to itself with 25-to-54-year-olds. TEGNA8 ran first at both 5 and 6 p.m. in total viewers. The wins with 25-to-54-year-olds went to NBC5 at 5 p.m. and Fox4 at 6 p.m. Led by Lethal Weapon, Fox again set the prime-time pace Wednesday, but not with much ratings firepower. Weapon was the night’s overall top draw, with 261,760 D-FW viewers in the 7 p.m. hour. It also drew more advertiser-prized 18-to-49-year-olds -- 73,763 -- than any other prime-time attraction. Fox’s Star then fell to 159,964 total viewers and 60,935 in the 18-to-49 age range. NBC’s competing Law & Order: SVU narrowly won the 8 p.m. hour in total viewers with 167,235. Among 18-to-49-year-olds, Star’s first half-hour was nipped by ABC’s Modern Family (60,935 viewers) before building its audience slightly to run first in this key demographic from 8:30 to 9 p.m.
Fox4’s 9 p.m. local newscast won its slot in both ratings measurements among the Big Four broadcast networks. But the numbers again were pedestrian (167,235 total viewers and 51,314 in the 18-to-49-year-old motherlode). Over on FX, the 9 p.m. premiere of the acclaimed Legion drew 43,627 total viewers, but with more than half of them (25,657) in the 18-to-49 realm. Back-to-back late hour repeats added a combined 36,356 viewers and 22,450 in the 18-to-49 demo. Here are the local news derby results for the fifth weekday of the February “sweeps” ratings period. NBC5 and TEGNA8 tied for first place at 10 p.m. in total viewers while Fox4 won among 25-to-54-year-olds (main advertiser target audience for news programming). Fox4 took the 6 a.m. gold in total viewers and tied NBC5 for the top spot with 25-to-54-year-olds. The Peacock again swept the 5 and 6 p.m. battles in both ratings measurements. Paced by their usual heavy-hitters, CBS and NBC controlled Tuesday’s prime-time terrain. CBS’ 7 p.m. episode of NCIS topped all attractions in total D-FW viewers with 407,182. And the Peacock’s 8 p.m. hour of This Is Us ranked as the runaway biggest draw among advertiser-coveted 18-to-49-year-olds with 202,047. NCIS also won its time slot with 18-to-49ers, as did This Is Us in the total viewers measurement. At 9 p.m., CBS’ NCIS: New Orleans ran first in total viewers with 218,133 while NBC’s Chicago Fire took the 18-to-49 gold with 86,592. ABC’s 8:30 p.m. episode of The Real O’Neals super-tanked with the night’s puniest showings in both total viewers (36,355) and 18-to-49-year-olds (9,621). Here are Tuesday’s local news derby results for the fourth weekday of the February “sweeps” ratings period. CBS11 pulled in the most total viewers at 10 p.m. while Fox4 led with 25-to-54-year-olds (main advertiser target audience for news programming). TEGNA8 had the most total viewers at 6 a.m. and NBC5 was tops with 25-to-54-year-olds. There are some early morning numbers of note here. TEGNA8 won in total viewers for the second weekday of the ongoing sweeps with just a 1.0 rating (72,711 viewers in a market of 7.271 million). And among 25-to-54-year-olds, CBS11 faded to near total invisibility with 3,007 in a market with 3.067 million in this age range. In comparison, NBC5, Fox4 and TEGNA8 were closely bunched. The Peacock led with 42,094, followed by Fox4 (39,087) and TEGNA8 (36,080). These are not heartening numbers for any of the four major combatants. Once considered fertile ground for viewership growth, the early mornings instead are becoming the equivalent of a setting sun, at least on area television screens. NBC5 otherwise continued to enjoy boom times in the early evening. The Peacock ran the table at 5 p.m., tied TEGNA8 at 6 p.m. for the most total viewers and won outright with 25-to-54-year-olds. The available viewing pool presumably is considerably older at 5 and 6 p.m., with many younger ones still at work or on the way home in rush hour traffic. Still, NBC5’s 25-to-54 totals at 5 and 6 p.m. both exceeded the station’s 6 a.m. showing in this key news demographic. 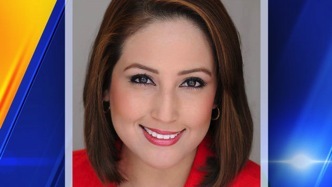 Maria Guerrero is joining Fort Worth-based NBC5 as a general assignment reporter. She’s scheduled to start on Monday, Feb. 20th after spending three years at KIRO-TV, Seattle’s CBS affiliate. Guerrero also has worked at TV stations in Baton Rouge, LA, Madison, WI and Albuquerque, NM. 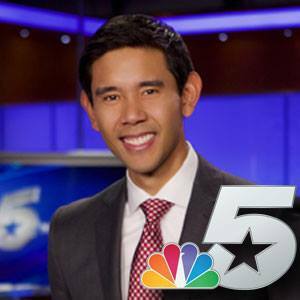 The Juarez, Mexico native, who grew up in Lufkin, TX, is bilingual and also will do some reporting for NBC5’s sister station, Spanish language Telemundo 39, the stations announced Tuesday. Fox’s regular night and time premiere of 24: Legacy, followed by the debut of APB, put the network back on Monday’s prime-time map. After a post-Super Bowl LI showcase (and a less than stellar showing), 24: Legacy drew 225,404 D-FW viewers in the 7 p.m. hour, losing only to CBS’ leadoff sitcom, Kevin Can Wait (232,675). But the new Jack Bauer-less version, with Islamic terrorists again at large, beat all competing programming among advertiser-prized 18-to-49-year-olds by drawing 89,799 of ‘em. APB, in which a cocksure hi-tech billionaire steps in to “save” a crime-ridden Chicago, then pulled in 247,217 total viewers and 73,763 in the 18-to-49 age range to sweep the 8 to 9 p.m. Nielsens in both ratings measurements. Monday night’s usual pacesetter, ABC’s The Bachelor, fell to third from 7 to 8 p.m. in total viewers before running second in the 8 p.m. hour. Among 18-to-49-year-olds, it lost to Kevin Can Wait in addition to the two Fox dramas (but by just a hair to APB). At 9 p.m., CBS’ Scorpion had the most total viewers (196,320) while Fox4’s local newscast was tops with 18-to-49-year-olds (41,692). Fox4 also returned to the top spot in the 6 a.m. competitions after a very slow start last week. NBC5 ruled at both 5 and 6 p.m. in total viewers and 25-to-54-year-olds. Three broadcast network series premieres dotted opening night of the February “sweeps” ratings period. Only CBS’ Superior Donuts fared fairly well after being gifted with a big lead-in from The Big Bang Theory. Big Bang as usual led all prime-time attractions Thursday with 378,097 D-FW viewers and 134,698 in the advertiser-prized 18-to-49-year-old demographic. Donuts then dipped to 239,946 total viewers, good enough to tie the second half of ABC’s Grey’s Anatomy from 7:30 to 8 p.m. Grey’s also won that slot among 18-to-49-year-olds, with Donuts a solid second. NBC’s 7:30 p.m. newcomer, the superhero sitcom Powerless, ran fourth in its time slot with 101,795 total viewers and 38,484 in the 18-to-49 realm. At 9 p.m., the first episode of CBS’ Training Day placed third in total viewers with 123,609, edging Fox4’s competing local newscast. It was the same story with 18-to-49-year-olds. ABC’s How to Get Away with Murder ran first in both ratings measurements. Wednesday brought mostly a batch of reruns. A fresh edition of Fox4’s 9 p.m. news topped all prime-time programs with 181,778 total viewers while CBS’ 8 p.m. reprise of Criminal Minds drew the most 18-to-49-year-olds (51,314). On Tuesday night, President Trump’s 7 p.m. announcement of his first U.S. Supreme Court nominee gave CBS an overall win in total viewers with 203,591. Fox’s The Mick, a bonafide midseason hit, pulled in the most 18-to-49-year-olds (102,627 in the 7:30 p.m. slot). Here are the Tues.-Thurs. local news derby results. Tuesday -- TEGNA8 and CBS11 tied for the most total viewers at 10 p.m., but CBS11 was alone in first with 25-to-54-year-olds (main advertiser target audience for news programming). NBC5 swept the 6 a.m. competitions while also winning at 5 p.m. in total viewers and 6 p.m. in the 25-to-54 demographic. TEGNA8 drew the most total viewers at 6 p.m. and nipped both NBC5 and CBS11 for the top spot at 5 p.m. among 25-to-54-year-olds. Wednesday -- TEGNA8 ran first at 10 p.m. in total viewers and tied NBC5 for the most 25-to-54-year-olds. Fox4 won at 6 a.m. in both ratings measurements while the 6 p.m. golds went to TEGNA8 in total viewers and NBC5 with 25-to-54-year-olds. At 5 p.m., Fox4 and TEGNA8 shared first place in total viewers and NBC5 took the 25-to-54 prize. Thursday -- On the first day of the February “sweeps” ratings period, TEGNA8 started strong with 10 p.m. wins in both total viewers and 25-to-54-year-olds. NBC5 swept the 6 a.m. competitions while the defending champ, Fox4, slipped to third place in both ratings measurements behind runner-up TEGNA8. The Peacock also prospered at 5 and 6 p.m., running the table at both hours.